Zoomax pocket size handheld video magnifier Butterfly is designed for the low vision people on the go. Its lightest weight and most compact size allow Butterfly to be hung around the neck or kept in the pocket, handbag or even purse. 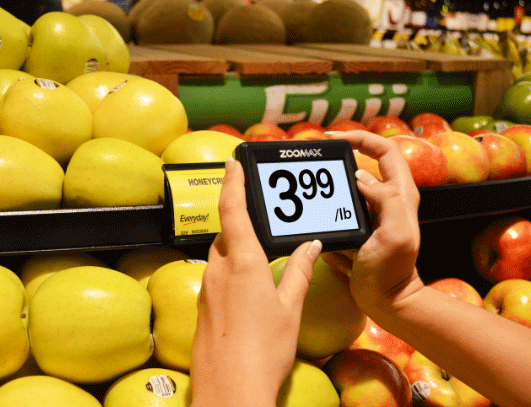 You may use it to read price label, menu and see things around you anytime conveniently. 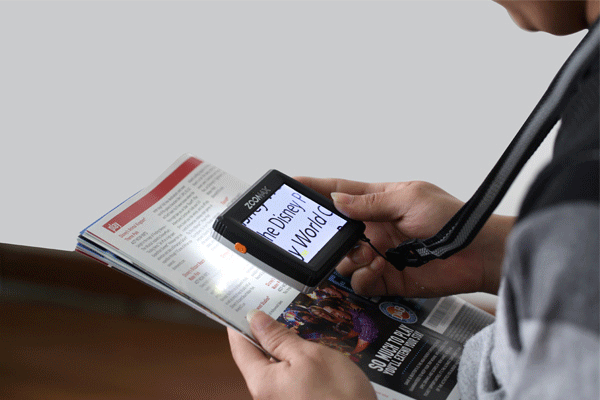 Butterfly is an ideal handheld magnifier for people on the go. Don't worry about where you should place it. Just hang this handy device around the neck or keep it in the pocket when you are out. Take and use it for reading anytime conveniently. It is close at your hand. No finding. Butterfly is smaller than your pocket and lighter than your purse! One tangibly handy button on the right top of 3.5 inch screen offers the main functions, both magnification and color mode adjustment. It's easy to grip and operate by one hand. When placed flat on the books or photographs, Butterfly promises the comfortable viewing angle with the foldable reading stand. The image of the material can be shot which cannot be reached and read, such as book on the high shelf. 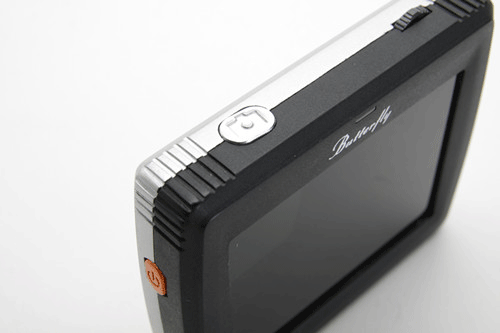 The auto-focus camera of Butterfly and image process technology ensure the clear image for visually impaired users. 5 alternative viewing modes make you read comfortably. Including the Zoomax Butterfly, I have had three different portable electronic magnifiers over the last 10 years, and while the first two devices were useful, I have found the Butterfly to be easily, the most useful to me. While the Butterfly's screen size is smaller than many of the others I've seen, for me it is drastically more useful. It is small enough to fit easily into most of my shirt pockets, which means that I can easily take it everywhere I go! To me, this is the definition of portability. It is also very light and actually weighs less than my cellphone! This feature lets it glide over papers and pages without moving or bunching the paper. Even though the screen is small (3½"), there is no meaningful blur or delay during motion which makes it easy to scroll across a page without losing your place. The different text contrast choices are very easy to scroll through until I find the one that works best. It is also very easy to scroll through the range of magnification to find the right text size. A very significant feature, which my other "portables" do not have, is the ability to turn off the camera light! This means that I can use it on backlit surfaces such as a computer monitor, or cell phone, without glare back! While the screen resolution does have room for improvement, I am sure that such improvement would lead to a heavier,costlier, and therefore less usable machine, and it is quite good as it is. On the unit that I have, the camerais located near the top, which means that it does take some practice getting used to using it, but I expect this to be only a temporary inconvenience untilI get used to it. Like every other vision aids that I've used over the last ten years, the Butterfly does have limitations, but overall,I have found that it does exceed my expectations and I recommend it to anyone currently struggling with other much heavier and more expensive units! The Butterfly is not perfect, nothing is, but the few shortcomings it does have are over shadowed by its portability, functionality, and ease of use. 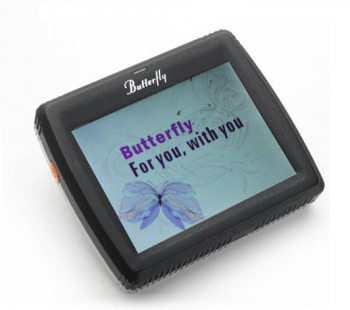 The Butterfly Magnifier is an amazingly handy device! I have tried several other electronic magnifiers for reading. Most were too heavy or difficult to use. Some while nice, actually had too many features, making it far less efficient to use in atimely fashion. The Butterfly is just right for on the go, everyday use by those who want quick, easy use in almost any situation. When I received the Butterfly, I decided to put it to the test. Due to the underlying disease that caused my visual impairment, my vision varies, never getting better than a certain baseline (20/400), but often gets worse. 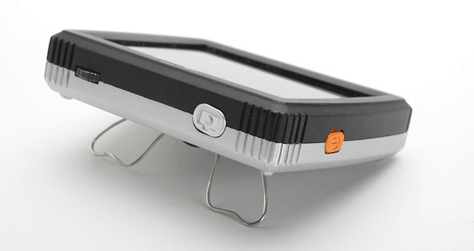 Electronic magnifiers I use must be versatile, light and simple to use with tactile controls. 1. The Butterfly is surprisingly light. I was highly doubtful the lanyard that came with it would actually be feasible in everyday use, but I was able to wearthe Butterfly out to a supermarket, then to lunch and a second store without any kind of discomfort. 2. The size allows for carrying in the back pocket of your jeans or easily in a purse. 3. The screen, while maybe too small to read a book for very long, is perfect for things like medication bottles, product packages, crafts, quick reading like advertizements or magazine articles and things like that. 4. There is an excellent zoom feature to magnify up to 15x, which allows for awide variety of impairment and accommodation of varying vision. 5. A snapshot feature allows you to take a picture of something you can't hold, and then view at your leisure. The pic isn't stored but it's highly useful forsomething like the cans on a supermarket shelf. Snap a pic and take a peek tosee what's on the shelf. Combine it with the zoom to either zoom in on the desired object then take a pic or vice versa. 6. Controls are conveniently located for one handed use of the most used functions. While they are on the right, it's still appropriate for lefties. 7. Power button is on the left side and requires a press and hold to turn it on and off, so there's little risk of turning it off accidentally while using it or accidentally turning it on in your pocket. 8. Butterfly's camera is located in the top center of the device, so the "aim" is natural...point it at what you want to see, and you've got it. No moving around to try and find what you want. 9. There is lighting on either side of the camera that can be turned off, allowingfor magnification of virtually anything from your PC to a magazine to a novel in either natural sunlight or indoor lighting. 10. The anti-glare screen, similar to some e-readers, is comfortable to use in all lighting situations. 11. With 5 viewing modes, one camera mode and 4 color modes (black on white, whiteon black, yellow on black and yellow on blue) there are options to view mostitems comfortably for most people. The most commonly used color modes are represented without an overload of options that the user has to scroll through to get the one they want. 12. The last used settings will be enabled when you turn the device on. For example, I most often use the camera mode to read pretty much everything. I can turn the Butterfly off and back on and it will be in camera mode. If for some reasons, I use yellow on blue, that's what will be there when I turn the device on next. 13. A stand on the back of the device allows you to use it on a flat item by just sliding it along as needed. I rarely use the stand as I find it just a tad awkward for reading anything at length, though I imagine it might be good forlight reading on a tabletop. 14. Controls can actually be found and identified by touch. Overall,I highly recommend the Butterfly for all those everyday light bits of reading that's often taken for granted. Easy to use, easy to handle, lightweight and quite versatile for a device of its class. I love it! The Butterfly handheld electronic magnifier is the smallest magnifier from Zoomax equipment we could test. With the use of one button, you can do almost everything to improve your reading. At first it seems not durable, but it appeared that it's very simple to use and very useful. Thanks to it's pocket size, small weight you can use it everywhere, no matter where you are, check up receits, labels etc. It fits even the smallest bag.